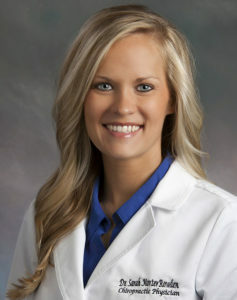 Dr. Sarah Rowden, D.C. is the owner and founder of NWA Health Solutions, in Rogers, AR. Dr. Sarah received her Doctorate of Chiropractic from Parker College of Chiropractic. She also holds a Bachelor of Arts in Psychology, Bachelor of Science in Anatomy and a Bachelor of Science in Health and Wellness. She is in the process of completing studies through the International Chiropractic Pediatric Association. The reason Dr. Sarah has so many credentials is due to her dedication to improving the health of mankind. She has devoted many years to her studies of health and wellness, both in adults and children. Dr. Sarah was born into a chiropractic family, both her father and grandfather were/are chiropractors, as well as aunts, uncles, cousins, and siblings. The Morter family has been in Rogers, AR for almost 50 years. Dr. Sarah’s grandfather, Dr. M.T. Morter, Jr., was the developer and founder of B.E.S.T., BioEnergetic Synchronization Technique, a technique used by health practitioners around the world. She was fortunate enough to grow up around such intelligent and determined people, and was inspired at a very young age. She credits her family with much of her success. Dr. Sarah is married to a chiropractor, Dr. Josh Rowden, and they have two beautiful daughters together, Evelyn Grace and Havyn Elaine Rowden. Being a parent herself, Dr. Sarah can relate to many trials and tribulations that parents go through. She feels that she can truly connect with other parents on raising children in today’s society. Dr. Sarah is very dedicated to helping children live the healthiest life possible. Dr. Sarah’s practice focuses on treating many conditions, including: ADHD, Chronic Childhood Conditions, Chronic Neurological Disorders, such as Migraines, Vertigo/Dizziness, Chronic Fatigue, Neck Pain, Back Pain, and many other conditions. Her primary focus in her practice is helping pregnant women and children of all ages. In order to provide groundbreaking care, Dr. Sarah attends many seminars annually to continue her studies. She wants to ensure each and every patient that she has the most up to date information. Dr. Sarah enjoys learning and expanding upon her very focused knowledge base.